I’m a web designer and SEO specialist, and have been for quite some time. Many of my friends have similar backgrounds. The other day, a few of us got together for lunch. It wasn’t a working lunch, just a chance to catch up. Still, I noticed that we spent most of the time talking about internet stuff. Specifically, we spent almost the entire lunch sharing horror stories about hosting companies we’ve dealt with over the years. I just don’t know what it is about web hosts. When they’re good, you barely notice them. 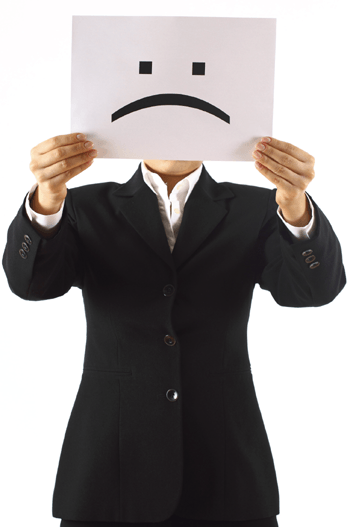 But when they’re bad… well, every internet professional in the world probably has at least one web hosting story which will make you laugh. Across the pond, they have an office and data center in Byfleet, Surrey, in the United Kingdom. Rounding out their international presence is a 2500 square foot facility in Brisbane, Queensland, Australia. Not bad for a company which literally started in a Michigan garage. This is a basic plan which includes everything needed to host a website. You get email and FTP accounts. The entire site can be easily controlled, by you, from a control panel. You’ll also have access to support for Nexcess team members. There are four shared hosting packages. They range from $6.95 to $21.95 a month, billed annually. The basic features of each plan are the same, with each plan offering more storage space, data usage and so on. WordPress is one of the most popular website creation programs on the planet. Whatever you’re doing with WordPress, Nexcess promises to help you do it better. Their WordPress services include hosting, blog optimization, daily back-ups and more. Simple WordPress hosting services start at $11.95 a month, with their top-of-the-line package running at a monthly $141.95. Magento is a widely popular e-commerce platform. Nexcess has everything you need to customize, enhance and secure your online store. Their Magento hosting plans run from $19.95 a month all the way up $189.95 a month. Nexcess knows ExpressionEngine well. But they certainly don’t know it as well EllisLab does, because EllisLab is the creator. 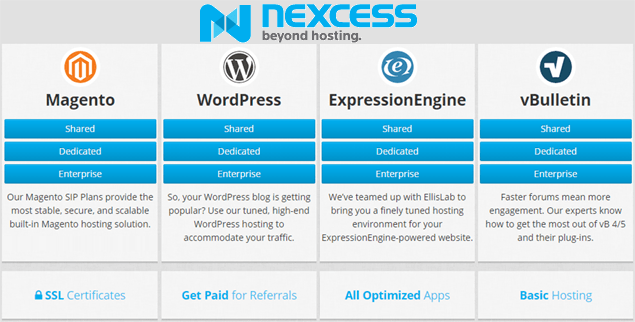 Fortunately, Nexcess has teamed up with EllisLab in order to provide premium hosting services for ExpressionEngine. 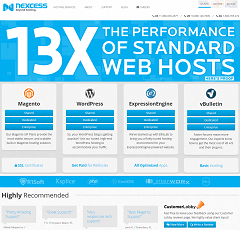 If your site was created in ExpressionEngine, Nexcess is the best hosting option available. Each plan includes two IPs, a 100 Mbps uplink, remote reboot access and more. Servers cost between $170 and $540 a month. Unfamiliar with how to run a server? Nexcess has tons of experience. They can help you with set up, maintenance and anything else you need. They offer three levels of server management, so you’re don’t have to pay for help you’ll never use. 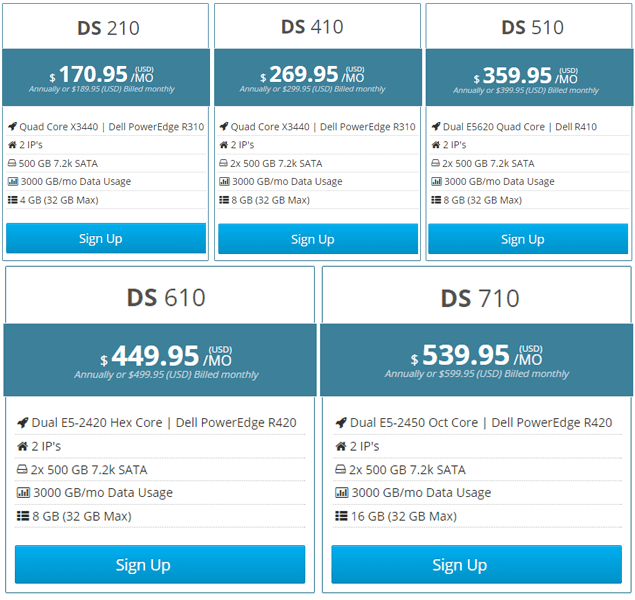 No matter what type of hosting package you have, upgrading is just an email away. As your site grows, a Nexcess team member will personally help you review your options and manage your growth. Nexcess is big. This can be a bit confusing for novice users. If you just want to host one website, and you don’t have a lot of experience with web hosting, you might feel a bit overwhelmed with all the options. Even for a seasonal professional, it can all be a bit much to take in. Here’s my tip. Whenever I was in need of a product or service for one of my hosted sites, I would search through the site a bit. If I couldn’t find what I was looking for, I simply emailed the Nexcess team and asked them to help me out. Someone emailed me back every time. Usually within two days, and often with 24 hours. Nexcess is also on the more expensive side. 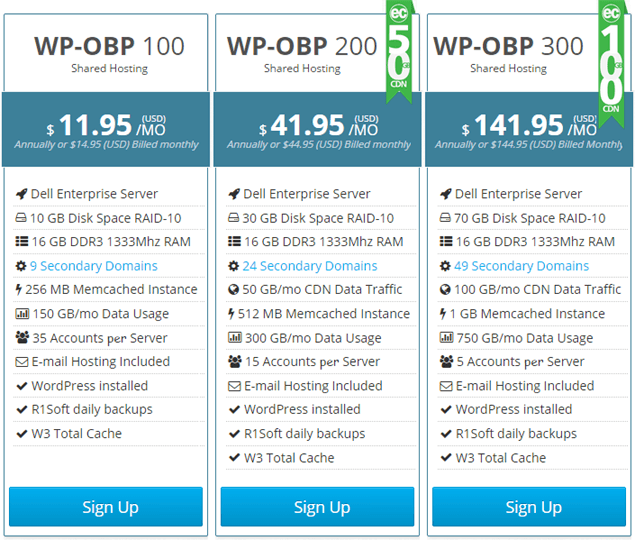 Obviously, something like a $140 monthly hosting package for a WordPress site is pretty high end. However, you absolutely get what you pay for. While you can almost certainly find cheaper options, with Nexcess you’re really paying for peace of mind. You’ll know your sites will be fully optimized, the hosting will be reliable and support will always be there when you need it. 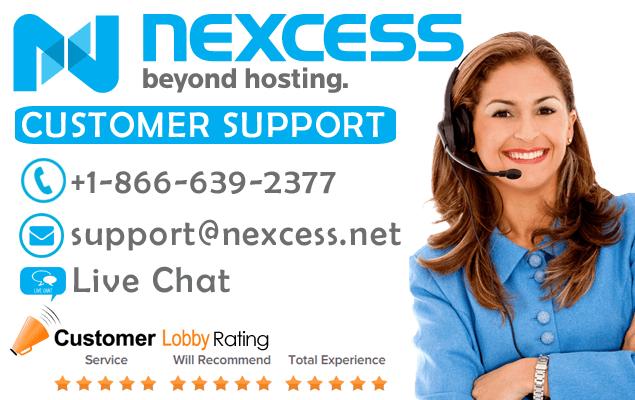 Nexcess support is highly praised on the Internet. Their Client Showcase page features hundreds of satisfied customers. 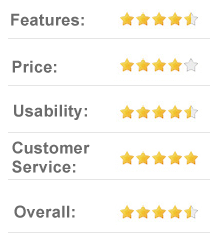 Plus, their average rating on CustomerLobby is a five out of five – and they have almost 400 reviews! I had no problems during the previous six months I’ve been with them, and I’m glad to see this was pretty common for most users. Their support staff is available every single day of the year. If you have a question or concern, you can go to the Nexcess site and submit a ticket. You can also log into to your client portal and live chat with a team member. Email is another option. Also, you can call. They have toll-free phone numbers for the U.S, the U.K. and Australia. So far, you can’t contact the Nexcess team via carrier pigeon, but based on their existing accessibility it’s safe to say that might be a future possibility. Interesting in learning on your own? They have a large knowledge library with hundreds of articles. Nexcess is not some small-time operation. They have offices in three countries. They offer a massive amount of services. They’re also on the high end when it comes to pricing. So I’m pleased to report that they still act like they’re running a small shop out of a garage. I was just one guy who used Nexcess to host one site. Yet every time I emailed or otherwise communicated with them, they acted like I was the most important customer in the world. Nexcess was a rare case where I noticed a web hosting service not because they did something wrong, but because they did everything right. They’ve earned my loyalty and my highest recommendation. The only downside I can foresee is a significant decrease is the hosting horror stories I can share with my buddies.